…by reason of use have their senses exercised to discern both good and evil (Heb 5:14). Dad didn’t say too much about the war. I understand that. But I do wish he’d said more. I should have asked more. When I bought a Poppy this year I said my Dad served in WW2. I was asked if he came through it (WW2) unscathed. He didn’t lose a limb if that’s what was meant. But he did have health issues (bronchial problems) throughout his life because of it. He lost all his teeth as well because of it. I can also remember him having awful nightmares. As a young boy, I would hear him wailing in the night. So no, he didn’t come through it unscathed. And I doubt many, if any, did. He served in the Reconnaissance Corps and two requirements (apparently) to be in the Corps were intelligence and aggression. I reckon those two characteristics served him (and others) well. The motto of the Corps was ‘Only the enemy in front.‘ Four stories he did tell me were these. No details. He told me how on one occasion a patrol went out but only one person came back. The man that came back was a Christian. I don’t know what that (Christian) meant. But it obviously affected him quite deeply and he never forgot it. Another time he was due to go on a troop ship but for some reason, he didn’t make the boarding. The ship was sunk and everyone on board died. Then he was on his bike (he was a dispatch rider) going from one side to another and had to ride across a ridge. Enemy artillery had targeted the ridge and as he went along shells were exploding behind him but he made it without being hit. One other incident was how he rescued an officer on the back of his bike. No details just the fact of it. 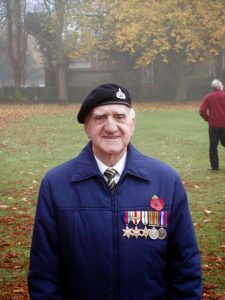 He always bought a Poppy and would watch the Remembrance Day service on TV but never attended any reunions and never joined the Remembrance Day parade. I think it was all too much for him. The memories were so awful. His medals were in a box in the cupboard. 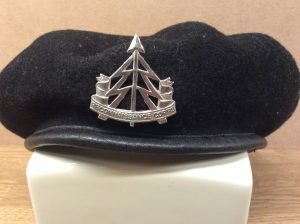 But many years later as a Christian, a serving soldier (weapons Instructor) in the Church encouraged him to get his medals mounted and join the Remembrance Day parade. And he did. So thanks Ian Fraser for encouraging him to do that. I was able to watch him march with other WWII veterans. I watched him with pride. I guess I didn’t think too much about it when I was younger but today I’m thankful for his service. And all those that served – many paying the ultimate price. Thank you for your service Dad. Whichever way you look at it, war is a terrible thing. A necessary thing sometimes maybe, but terrible all the same. As veterans die there’s a renewed realisation, it seems, that we ought not to forget their service and the horror. The war to end all wars (WW1) left the door open to another one. And so conflicts continue around the world. There will be wars, and rumours of wars, until the end said Jesus (Matthew 24:6). And so it is until The Prince of Peace Himself comes to reign. He loved me – blessed be His Name! Before they died, my Dad and Mum came to know and follow this risen Lord Jesus Christ. Have you? 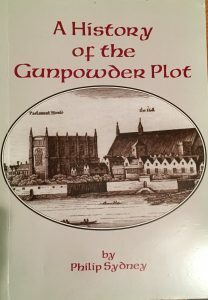 My second (of three now) book on the Gunpowder Plot has the catchy title of A History of the Gunpowder Plot by Philip Sydney. If I have it right this was published in 1905 – 300 years after the plot – by Protestants Today. I bought it for £5.95. There are few illustrations and no sub-headings to speak of and so the reader is confronted with page after page of dense text. Mercifully the text type is easily readable and most of the chapters are short. Every chapter has quite a few endnotes which need to be read. There is no index and no bibliography. Not a particularly inviting book – so probably a book of its time. Very plain. Perhaps mistakenly, I read a few reviews on Amazon that said it was dry and difficult reading. One ‘reviewer’ didn’t finish it. If I’d taken any notice of their reviews it would have stayed on a shelf in the Christian Bookshop. I obviously took no notice of them and bought it anyway. But given my comments above and the reviews I can see what they mean. But, I really enjoyed it. I think I must be weird! The book has no Evangelistic emphasis (as the previous book) and has no real context other than a few meager references as you move through the book. What I’m enjoying though is all the detail – another thing the ‘reviewers’ didn’t like. There are a lot of quotes from the original case and a number of letters are included. Sydney is quite upfront about his own belief that ‘it was a put up job.’ The Government (that is, Robert Cecil – Secretary of State) it seems had all the main players on a ‘watch list’. It’s extraordinary the plotters thought they could get away with it, and even when the game was up they still thought they could stage an uprising in the Midlands. There are a few references to Dunchurch, Rugby (where I grew up), and several other places I know well. Dunchurch is built around a crossroads with a couple of historic Coaching Inns and a house (then The Red Lion Inn) that apparently was where some of the plotters met. I knew a guy some years ago that lived there and have been in the house. Sadly, at the time I had no interest in any of this – a shame that. Next time I’m in Dunchurch I’ll get a few pictures. The propaganda value of gruesome public executions seems quite obvious – especially if the authorities knew all the time. Some things don’t change. Although, the plot itself, had they actually pulled it off, would have changed the country. It was of epic proportions. But it failed. Thank God. The historic controversies (so I have learned) concern when the authorities (Cecil) knew of The Plot, the delivery of a mysterious letter to Lord Monteagle (or Mounteagle) warning him to stay away from Parliament on November 5th and whether the Jesuit hierarchy also knew of The Plot. Sydney deals with these and drops in his disagreement with other views as he goes along. The book seems quite thorough and as far as I can tell he argues his case. The whole thing is an incredible story. I suppose there is always going to be room for conjecture on some of the issues but Sydney quotes from primary sources – letters, trial transcripts and secret transcripts between prisoners in The Tower (that is, The Tower of London). I need another visit to the Tower myself now after reading about The Plot. The whole episode raises enormous questions, especially about propaganda, freedom of religion, security and torture as a means to elicit information. And so in that sense reading of The Plot is ever relevant as we face those very same questions in our own day. So I have another book to read on The Plot that will be a bit more demanding. I’ll do a post in due time. 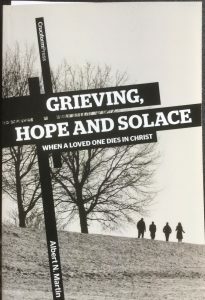 I recommended ‘Grieving, Hope and Solace: When a loved one dies In Christ‘ by Al Martin two years ago (almost to the day) but that was only on reading the first chapter. At long last, I have finished it. When I first started the book the grieving was still quite raw. It’s taken me these two years to read it maybe because I completely entered into the author’s own experience. I don’t think on a practical level, for me, it’s quite as helpful as the book by James White. Al Martin’s book though is answering a different question. The book is focused on dealing with the bereavement of a spouse and is asking ‘What happens to a Christian loved one when they die?’ He not only answers that question but shows the relevance of that knowledge to the here and now for the grieving spouse. The book (my copy) was first published by Cruciform Press in 2011 and written several years after his wife died, based on a series of sermons he preached soon after she died. It’s a short book at just 116 pages as this usually needs to be. it’s easy to read with short chapters with several headings for each chapter. There are only a few endnotes but with lots of scripture references throughout. It’s divided into Four Parts with a total of 13 Chapters plus a preface. Although there’s a lot of theology I definitely entered into his grief. It touched a lot of nerves for me. I’m grateful for that. My copy is full of notes, underlining and asterisks. I can only mention a few things. The reality of his grief is evident. He doesn’t hide it. This paragraph from page 21 I thought was very helpful. There are three sections in Chapter 10 (God’s Purposes In Us Through This Death) that I noted by writing Vital!!! Couldn’t be overstated! The headings are: We Have Opportunity to Grow in Fellowship (page 93). For this, I had in mind some very special people who helped immensely during Sue’s illness and after she had died. Also: The Word of God comes more Vividly Alive (page 94). This is so true. The Scripture becomes alive in a completely new and fresh way. And: We Become More Heavenly Minded (page 94). Heaven is close. A severe mercy. Indeed so. I’m not a shepherd but God will sanctify His people. In all honesty, as I’m writing this and looking through the book at my notes and underlinings I realise how helpful the book has been. It helps enormously to have your own experience confirmed. Not everyone can enter into it with you but this author, for me, has done that. And for that, I’m truly thankful. I’m sure he will do that for others. Not for everyone, but it will help some. Maybe it will help you. The only parts of the book I found unhelpful and that jarred with my own experience is how perfect his wife was through her illness right up until her death. Sue wasn’t like that, and yet I think for all her struggles with dying she displayed the grace of God in a way that wouldn’t have been possible had she been so perfect. Obviously, I can’t criticise Al Martin’s wife Marilyn for dying so well (by the grace of God in that way). My note in the book reads: ‘We must not make these things the norm, wonderful though it is.‘ I’m glad that was her testimony. I just don’t think that is the experience of most people. As Christians, we don’t want to admit how hard dying is. Death is the final enemy. And it is horrible. Really horrible. So in Sue’s dying, I saw a paradox. I saw how hard it was for us both, especially for her, and yet I saw the grace of God displayed through her in a truly remarkable manner. That glorified God I believe. The book closes with a Gospel message that tells it straight but points to the only hope. That hope is found in The Lord Jesus Christ, the only one who has conquered death. I still recommend the book. I do wonder about the recommendations that come on the cover with this type of book. Do they know anything of what the author is talking about? I think the answer is often, no they don’t. That’s just my opinion, as all this is. There is so much in the book, not a word is wasted. Ministers of the Gospel ought to read it as they are going to encounter grief in their people. The book will help prepare you. Grief is such a personal thing. I’m not sure it would be the first book I’d reach for to give to a grieving spouse, but then it depends who it’s for. It’s not a touchy-feely book, but it is real. Above all, we need the reality of Christ and His Word and His presence. This book by God’s grace will help. Order it from your local Bookshop. I’d love the opportunity to speak with the author. The Ligonier State of Theology Survey shows Evangelicalism is in a State. 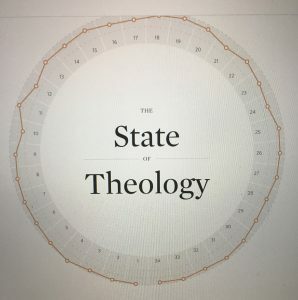 The Ligonier State of Theology Survey is now available. Thanks for the information and the invitation to explore the data. There are some worrying results. The two that immediately stands out is the question on the Trinity and the follow-up question on who Christ is. These are for Evangelicals – so called. 2018: 78% agree vs. 18% disagree. 2016: 71% agree vs. 23% disagree. It’s figures like that that give strength to Mormons, Jehovah Witnesses, Christadelphians, and Muslims. I’m sure these groups will find the survey quite encouraging. It’s just extraordinary that on the one hand there’s such a high percentage agreeing with a Trinitarian statement and the contradictory finding on the person of Christ. It’s actually worse this year!! What would a survey here (UK) reveal? Honestly, I dread to think! I tried to sit and think about it for a while as I’m sure many reading the results will have done. And with a great deal of soul-searching and dismay, I shouldn’t wonder. What is going on? Churches that I have been a member of teach unreservedly that The Lord Jesus Christ is exactly that, LORD. That is, Jesus is God. He is the second person of The Trinity and is co-equal with God The Holy Spirit and God the Father. Read The Athanasian Creed for a fuller statement. I’m thankful for these Churches. And yet, to my knowledge, these doctrines have never been taught in a systematic way. There is so much high-quality material available that we really have no excuse at all. Much of it coming from America – the same America of these results! History plays a major role in this. Why do I say that? The battle over the person of Christ was hammered out centuries ago. Yet the writing of those men is not only relevant to today but vital. Dr Nick Needham has edited a wonderful book of Daily Readings from The Church Fathers. The persons of the Trinity take centre stage. And rightly so. I have heard it said that what the Church needs is an understanding of the humanity of Christ. And I understand that. But it cannot be to the detriment of His Deity. You are in a Church where good teaching takes place. Thank God for it. Friends, especially those brought up in even a good Church, have had to ask themselves if they believe what they believe because that’s what they are told or because that’s what they believe for themselves. Believing these fundamental truths needs the operation of The Holy Spirit. There’s no denying this. But on the other hand, to believe them for oneself needs the opportunity to engage with those truths. What better way to engage than through Church History or The Reformed Confessions. Well, I would say that wouldn’t I. Yes, it’s a hobby-horse that I ride occasionally but the results, I think, of this survey, justify a good gallop! I’ll leave it to others to analyse the data but it isn’t good. How would you answer? You can take the survey. 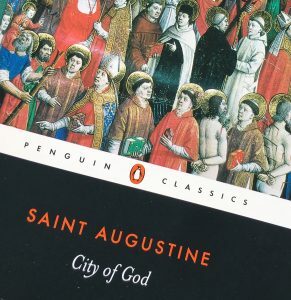 I thought it might be a good idea to read Augustine’s ‘The City of God’. A good idea until it arrived! It is a massive great thick tome. I decided to get help ‘if’ and it’s a big ‘if’ I decide to read the thing. 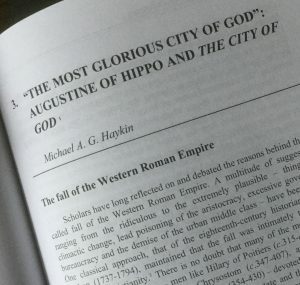 There were some old Westminster Conference papers going cheap and in 2005 a paper was given by Dr Michael A. G. Haykin on Augustine’s work with the title ‘”The most Glorious City of God”: Augustine of Hippo and The City of God.’ I don’t know if the paper is available online. Reading Michael’s paper it was a surprise to find that Christians had attached themselves to The Roman Empire to such an extent they were at such a loss over its fall. Not so Augustine. Eusebius, sometimes called the father of Church History, viewed history through the lens of The Roman Empire. So that in ‘Eusebius’ hands the Roman state has become a sacred realm. (page 42).’ This is the beauty of Augustine’s work, it doesn’t rely on particular Empires but is a Biblical view of history that works for all ages. It was great to discover this because it is exactly what I was hoping for. Many Empires have come and gone. I was left asking if the European Union is an Empire? Is it? I believe it is. It has a President and a Parliament with Vassal States just like any other Empire. And it will come to an end just like the rest. I find it astonishing some are so Anti-Western Colonialism or Imperialism. Don’t they realise there were a great many Eastern Empires? Western Colonialism will go just like the rest. The British Empire has gone. The Ottoman Empire has gone. The Egyptian Empire has gone. The Persian Empire has gone and so forth. It seems to me that (some) Christians are unable to conceive of a world where The UK is not part of The European Union. So, one reason for reading Augustine’s weighty tome is to come to a better understanding, not only of history, but the flow of history, and of the European Union as an Empire. And, as an Empire that will not last. Dr Haykin sets the context and then very helpfully gives an overview of the book which I won’t detail here. When I do finally get round to reading the book it will be good to have an overview to hand. Maybe I’ll write some more at another time. If your hope is in the State (The City of Man) you are going to be hugely disappointed and will ultimately fall with it like ancient Babylon. But if you are looking for another city, namely, The City of God, then you will also share in its final triumph when the King in all His Glory comes to take residence. 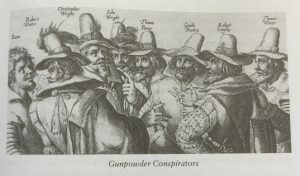 This year I have two books to read on The Gunpowder Plot. This is the first of the two. 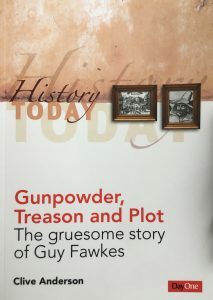 The full title is Gunpowder, Treason and Plot: The gruesome story of Guy Fawkes. Published by Day One. The author (Clive Anderson) ‘leads tours to the British Museum, Greece and the Middle East.’ I’ve been on one of his British Museum tours, and it was absolutely brilliant. On page 11 Clive tells us ‘This was to be the greatest terrorist conspiracy in British history, for its aim was the destruction of King and Parliament.’ I remember the Brighton bombing where an attempt was made to kill the Prime Minister (Mrs Thatcher) and her Cabinet. They missed their main target, but even so, the IRA bomb killed five people and 34 were injured. 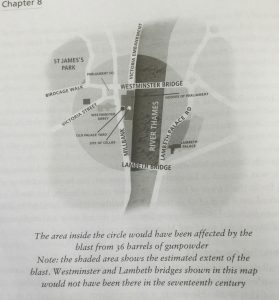 The Gunpowder Plot would have been far far more destructive (See Blast Map Illustration, page 96). The author spends a few pages discussing religiously motivated terrorism (Chapter 7). I’m old enough to remember ‘penny for the guy’ and burning an effigy of Guy Fawkes on the bonfire. We don’t do either of these anymore (unless its President Trump). In fact, we don’t really remember the 5th of November at all – including William III landing at Torbay, Devon in 1688. Other than we set off a few fireworks and maybe have a burger in a bun. Christianity still doesn’t get its own history. He gives a good overview of the background (from Henry VIII to James I) about why in 1605 the plotters would want to blow up the Houses of Parliament and with a ‘what if’ scenario (pages 110 – 113) had they succeeded. In between, we get profiles of all the main characters. Unless I missed something it seemed a bit strange for the author to speak about Elizabeth I and then we are suddenly introduced to James. Nevertheless, I enjoyed reading the book. It was quite easy reading, apart from all the typos, of which there are many! Perhaps the publishers could do something about that at the next printing. He reminds us that it was a Catholic Plot to blow up and plunge into chaos a Protestant government. Thus, returning England to Roman Catholicism. He doesn’t go overboard on detail and didn’t go much into what the authorities actually knew, although he alludes to it. The gruesome bits were about how the plotters were dispatched. And it was very gruesome, and quite literally a spectacle. He includes, in table form, a summary of all the plotters referencing how and when they died. Not all were executed. The leader, Robert Catesby (Not Guy (Guido) Fawkes), was killed in a Butch Cassidy style shootout at Holbeach House. Chapter 11 (an appendix really) is a sermon by Spurgeon. Yes, it was good to read Spurgeon but I wasn’t sure if it added anything to the book. It did remind us that we don’t corporately remember much at all. Reformation Day, for example, is totally lost on most Christians it seems to me. There’s a brief glossary of terms at the beginning, and with lots of headings throughout the book, an index is probably unnecessary. And at £7.00 it won’t break the bank. Eze 24:16 “Son of man, behold, I am about to take the delight of your eyes away from you at a stroke; yet you shall not mourn or weep, nor shall your tears run down. Eze 24:18 So I spoke to the people in the morning, and at evening my wife died. And on the next morning I did as I was commanded. I was trying to think what it feels like to have ‘the delight of your eyes taken away.’ I described it the other day like having your insides sucked out through your eyes. The inner pain is indescribable. Unless you’ve been through it you have no idea. So like I say, I feel for Ezekiel. Whether his wife had been ill for some time we aren’t told. But it seems to be sudden and unexpected: hence literally ‘at a stroke’ would be the best interpretation I feel. A mercy really, for him and his wife. No protracted illness for her or long-term care for him. Nevertheless, a very hard providence. If a man like Ezekiel delighted in his wife, I’d expect her to be a Godly woman. There was more than looks going on here. Perhaps I’m reading too much into it but it seems to me this verse from Peter would describe Ezekiel’s wife and the inner beauty of her godliness. 1 Peter 3:4 ‘but let your adorning be the hidden person of the heart with the imperishable beauty of a gentle and quiet spirit, which in God’s sight is very precious.’ (1 Peter 3:1-6) Ezekiel will see her again. He knows this. His faith is in The Redeemer, the One to come. That is, his faith is in Christ. As was his wife, I believe. This softens the blow, but a blow Ezekiel would have keenly felt. Here we are in no doubt as to why Ezekiel’s wife is taken from him. It’s for a sign to Israel. And is for their good. Though it falls on unrepentant hearts. And, we are specifically told that God was going to ‘take away the delight of his eyes’. The cause is known. We don’t have to try and work it out or make apologies for God. I certainly feel no need to make apologies for God and feel no need to defend the fact that He is the potter, and we are the clay. (Isaiah 64:8) He is The Lord, He does what He wills. Ezekiel wasn’t to weep or grieve – he was allowed to quietly sigh – for his wife even though everything within him would want to. And God knows this, otherwise, why give that command to not weep. God isn’t oblivious to what this will cost Ezekiel and the pain His prophet will experience. Even in this, He is still ‘the Father of all mercies.’ Ezekiel is allowed to sigh, ‘but not aloud.’ What a sigh that must have been! We aren’t told anything about Ezekiel’s wife other than that she was ‘the delight of his eyes.’ That doesn’t necessarily mean she was unbelievably beautiful to look at, but it does mean he loved her very much. She was a delight to him. When he saw her his heart skipped a beat we might say. She was to be taken from him. She wasn’t lost but taken. To the unbeliever, and maybe for some Christians, this will seem incredibly cruel. However, the caricature of a vindictive and hateful God just isn’t true. I know. I’ve walked in Ezekiel’s shoes. Admittedly, I wasn’t commanded to ‘weep not’ like Ezekiel but I do know but what it’s like to have ‘the desire of your eyes’ taken away. And taken away by God. Like Ezekiel, I was under no illusion as to who was in control. It was The Lord who took away ‘the delight of my eyes.’ I could say with Job “Naked I came from my mother’s womb, and naked shall I return. The LORD gave, and the LORD has taken away; blessed be the name of the LORD.” (Job 1:21) This is a salutary lesson for us all. I’m sure Ezekiel wasn’t expecting this. He could say perhaps with Job ‘For the thing which I greatly feared is come upon me, and that which I was afraid of is come unto me.’ (Job 3:25) We are NOT the masters of our own destiny. We aren’t in control. That thing you live for could be gone ‘at a stroke.’ And God doesn’t have to ask your permission or give notice. God can take away from our lives whatever He pleases – and that ‘at a stroke.’ Don’t deceive yourself into thinking all will be well when without Christ and without God, it won’t be. Had Ezekiel sinned (I mean here in a specific instance as we are all fallen – including Ezekiel)? He had not. Had his wife sinned? We aren’t told, but I think we can infer not. The death of his wife then illustrates in a most tragic and powerful way the sudden destruction that is to come upon Jerusalem. Did the people get it? Did they respond to the sign? No, they did not. Will you respond to this sign? It’s as relevant now as it ever was. In our materialistic age, especially here in the West, we push our ‘inalienable rights’ to the limit. All the time God could take everything away at a stroke. Yes, and even our most precious things. And even our very own lives. Jesus put it this way ‘You fool, this night your soul is required of you, and the things you have prepared, whose will they be?’ (Luke 12:20) Without being overly dramatic, this could well be your last day on earth. By evening you could be having to give an account of yourself before God! Without an advocate, without a Saviour that is, that is not something to look forward to. It probably seems quite extreme the lengths The Lord will go for the good of His lost people. He took Ezekiel’s wife, but that’s as nothing compared to the plan of God to rescue sinners. He has done this by sending into the world His Son. And the Son comes Himself to rescue and redeem. Heb 10:6 in burnt offerings and sin offerings you have taken no pleasure. The cost of Redemption is plainly stated by Christ ‘The thief comes only to steal and kill and destroy. I came that they may have life and have it abundantly. I am the good shepherd. The good shepherd lays down his life for the sheep.’ (John 10:10&11) Nothing but the blood of Christ can redeem sinners like us. This is extreme love! You have heard this and you know this. Giving out Gospel Tracts is hard work. One Saturday morning members from the church went out into the town to give out evangelistic leaflets and if possible get into a conversation. Our church does this once a month or so. I do not find this ‘cold calling’ style of evangelism easy. In fact, that’s an understatement, I find it incredibly difficult. It’s not talking to people I find difficult, there’s something about giving away literature in that cold manner. I don’t know why this is. Honestly, I question whether this is my calling even though I’ve done it for years – door to door and open-air preaching. Maybe I’m just doing it all wrong. The last time I experienced something new. Call it what you will but I just completely lost it. It was as if I was paralyzed. I just couldn’t do it. I said to myself ‘the fear of man brings a snare’ but eventually, I went home defeated and very downcast. My stomach was all churned up. I felt dreadful. It was physical. It just never occurred to me that it could be some sort of attack by The Devil. Maybe it was. I don’t know. Probably pride related. I’m kicking myself really because if that was a moment of intense weakness, that was the time to rely on God’s power in weakness. Maybe it was some sort of ‘fainting fit’ as they were called. Maybe God was letting me know my complete and utter inability and that this was a time to trust and not a time to rely on my own feeble inner resources. My own feeble resources dried up – completely dried up! This is a good thing to know. We aren’t about God’s work in our own strength. We might get the blessing by doing the work of evangelism, but we don’t get to have the glory. We daren’t have the glory: that belongs to God alone! Can any good come out of this? The first thing to know is that we need to be praying. We need to be praying in the prayer meeting. We need to pray as a team (however many that might be) before going out. And then to cultivate an attitude of dependence even if that means a feeling of complete despair in our own capability. The second thing is to aware of your fellow workers. You might not be the only one conscious of complete inability. Therefore support one another. It’s very easy to get discouraged in the work. Support your struggling brethren in Gospel work. For some of us at times, it is best not to be left alone. Most of the time I’m probably fine on my own but it was a good reminder that we aren’t Mavericks – even when going out from the same church. And we aren’t sufficient in ourselves either. Our sufficiency is of God. So if someone came to me now, armed with my recent experience, I would say something like: ‘Be courageous Brother, stand with me and we’ll enter the fray in the fellowship of the Gospel – let’s give out tracts together’. It probably all sounds quite pathetic. If you aren’t a Christian you might think we are a bunch of nitwits. But the reason we do this ‘work’ is because we want people like you to trust in Christ and be saved. There’s no other reason for doing it. I discovered nearly everyone that Saturday found it incredibly tough. Perhaps you find it hard work as well. So what about next time? Will there be a next time? By God’s grace, there will be. But next time should the same thing happen – and it might – I need to look up, not in. Easy to say. We’ll see. Some Christians are very able at giving out tracts, I’m not. I thank God for those that are and it’s a joy to see. Since starting to write this post a few weeks ago, in our prayer meeting, we have been going through 2 Corinthians and considering being weak. It’s not a pleasant feeling and is completely ‘counter-cultural’. We have another Evangelistic opportunity later this month. In some ways, I’m looking forward to the sense of dread, that feeling of despair so I can be weak for God. In other ways, I’m dreading it. But it’s not about us, it’s about Christ. I’ve heard it said or prayed over the years something like ‘O Lord if you do not meet with us we are wasting our time’. Roughly translated that means we want to feel and know the presence of God in our meetings. And what Christian wouldn’t want that! I get the sentiment, I do. I do want to experience the presence of God. But as I’ve thought about it, why would it be a waste of time to do something that Christ has directly commanded us in His Word to do? And, on top of that, we have promises that tell us God is with us. We aren’t told ‘when you meet together you’ll have a gooey warm feeling’. But we are told He will be with us. As I read through ‘The Bruised Reed’ by Richard Sibbes, this paragraph recently stood out. Obedience is most direct when there a nothing else to sweeten the action. Although the sacrifice is imperfect, yet the obedience with which it is offered is accepted. We could apply these words of Sibbes in many ways, but let’s apply them to when the Church in obedience gathers for worship. When we meet together we want it to be sweet. We want something to ‘sweeten the action’ as Sibbes calls it. There’s nothing wrong with that. But if we engineer our services to make sure it’s sweet, I do have a problem with that. Whatever it is that’s added, or taken away (e.g. pews), let’s make as sure as we possibly can that it isn’t to ‘sweeten the action’. Often I think it’s because we aren’t feeling something – whatever that something is – that we make adjustments to our services to sweeten them. Whereas Sibbes is telling us that because there’s nothing in it for us except the obedience, God accepts that. God accepts our obedience even if it isn’t sweet to us. Are we really adding it because we think the action is Biblical or because it makes us (or others) feel good, or sweet as Sibbes call it. Our obedience is already tainted, it is an imperfect sacrifice, let’s not make it any worse. Especially when God accepts it for Christ’s sake. Christ has offered the perfect sacrifice and is the only ‘sweet smelling aroma’ that’s required. Praise God it is so. The Lord Jesus Christ – Wonderfully gracious and compassionate. I remember many years ago as a relatively new Christian reading this verse for the first time and being amazed by it. I’m still amazed when I read it: staggered that such a verse should be in the Bible at all. Think about it, Jesus tells His disciples they have stayed with Him in His trials. Shouldn’t it be the other way round? Isn’t it Jesus that stayed with them! And us! Think back over the last three years of Jesus’ ministry. The Disciples had been with Jesus and often displayed their foolishness, their proneness to division, their pride and lack of compassion. Added to that, the fact they were often clueless and showed little or no understanding to the amazement of The Lord. Then immediately after speaking these words to them, Jesus tells Peter that he’s going to betray Him. Even then He tells Peter that He had prayed for him and that his faith would not fail. 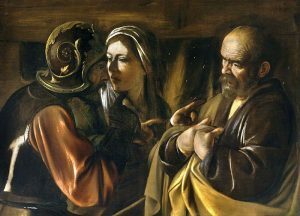 He even tells Peter when he is restored to strengthen his brothers – the other disciples. Not only was Jesus aware of their past and current failings, but He also knew they would shortly all be running away and that Peter would deny Him three times. We can be very quick to judge our fellow believers. Sometimes it’s as if we are looking for evidence that a person is not a Christian at all. Well, a Christian would never do that! Or, a real Christian would never say that! Yes, it’s shameful how we can all behave at times, and how judgemental we can be. But The Lord isn’t like that, His compassions they fail not, His mercies are new every morning. When we fail or deny our Lord, as we surely will in some way or another: When we are restored, strengthen our brothers. Encourage your fellow Christians. Help them to avoid where you fell or help them out of the same mess you were in. let him know that whoever brings back a sinner from his wandering will save his soul from death and will cover a multitude of sins (James 5:20). This is to be Christ-like. We haven’t just wandered from the truth, by nature we have run after error and falsehood. Yet at measureless cost, Christ has brought us back. The Lord Christ has saved our souls from an eternal death and through His sacrifice on Calvary has covered a multitude of sins by shedding His precious blood! Then here in Hebrew 2:11 ‘both He who sanctifies and those who are sanctified are all from one Father; for which reason He is not ashamed to call them brethren,’. This is the word of God, be encouraged that though we can be ashamed of Jesus, He, is not ashamed to call us friends and brethren. Greater love has no one than this, that someone lay down his life for his friends (John 15:13). If you are not a Christian this must seem like sentimental slush. Yet if you were to realise the great love God has for sinners the reality of His great love would be a source of wonderment to you. William Williams, 1717 – 1791. Let us look to the friend of sinners, the one who died but is risen from the dead to be a living Saviour. The following was my Dads favourite hymn which we sang at his funeral. What will be sung at yours? He sought me – Blessed be His Name! He found me – Blessed be His Name! He saved me – Blessed be His Name! I’ll praise Him – Blessed be His Name! xercised on F. F. Bruce – The New Testament Documents: Are they reliable? Hershel L Harvell Jr on F. F. Bruce – The New Testament Documents: Are they reliable?